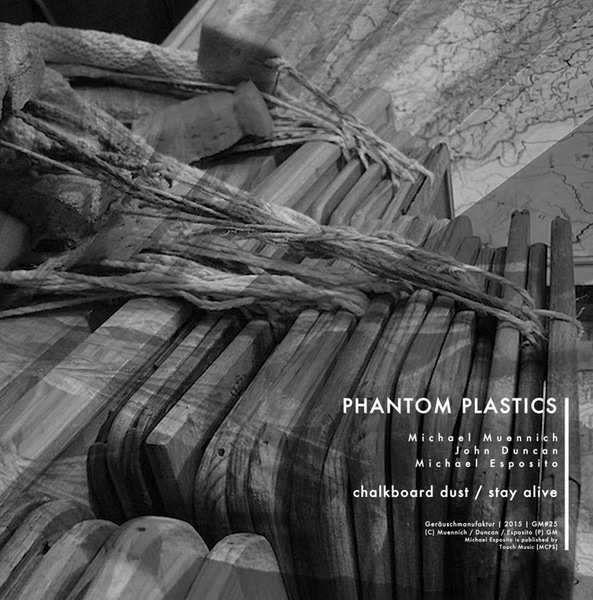 The latest installment in Michael Esposito's ongoing "Phantom Plastics" Flexi series, which has seen collaborations with the likes of Scanner, CM von Hausswolff, Francisco Meirino, Per Svensson and others. For "Chalkboard Dust" Muennich and Esposito created a minimal composition of field recordings, amplified small objects and Electronic Voice Phenomena. Their collaboration is accompanied by "Stay Alive", a carthartic solo voice ritual by John Duncan on the B-side. White, square flexi-disc with black label print, housed in a semi-translucent 3/4 cover.